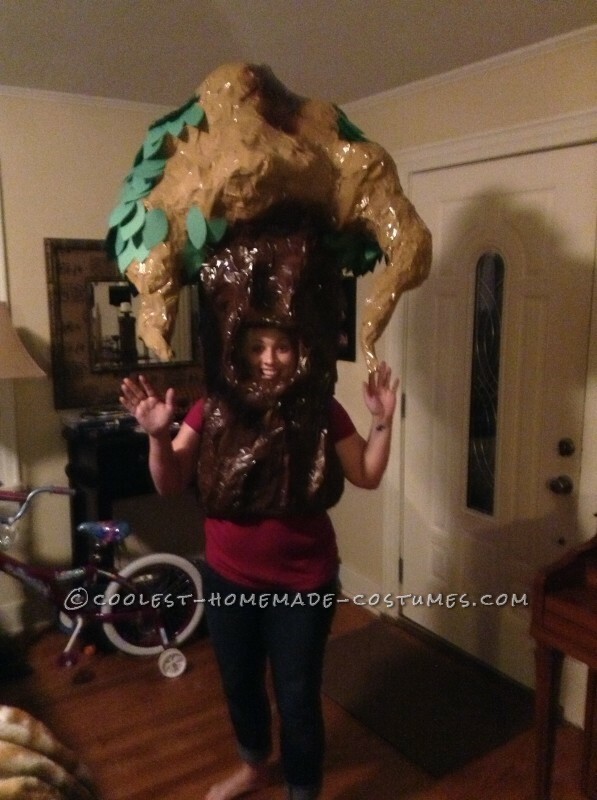 My eight-year-old daughter had to dress up as her favorite literary character for school this year, so when I was tossing around ideas for Halloween costumes my favorite childhood book, The Giving Tree, popped into my head first thing. I’ve always loved the story about the little boy going through the stages of life with its ups and downs and the selfless apple tree, giving everything of herself in the greatest example of unconditional love. This is where you go, “Aww!” Well, it wasn’t all unconditional love on my end making it, for sure. It took some trial and error, but I found the lightest materials in newspaper, a lot of brown packing tape (I used about a dozen rolls, so buy in bulk online! ), and a few wooden dowel rods (I used seven). First, I used my husband (a good-sized man compared to my smaller frame) to build my base around. Using an old cardboard box I cut up, I created a solid round base at the top with the dowel rods and packing tape. Then, I had my husband hold the base as I wrapped the packing tape sticky side out around him until about my waist height (to allow me to move freely). I then slapped some newspaper on the sticky side and wrapped more packing tape over that sticky side in. After my base was created (making sure to leave holes for arms and face), I used crumpled newspaper and more tape to establish the bark-like texture on the base. I also used newspaper and tape on the top part for my base, but real branches could also be used. I actually used real branches at first, quickly deducing that it looked too real for an illustrated character. I decided to spray paint my base, but the light-brown packing tape could work alone for a tree appearance. Lastly, I spent about four hours of my total 12 hours of work time in hot-gluing the green construction paper leaves I cut out. Add some fake apples and there you go! 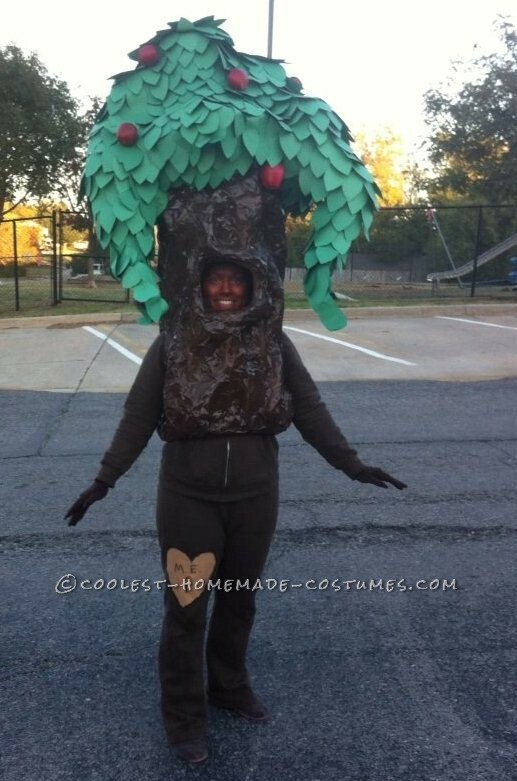 The greatest part of the reactions I received was that people didn’t immediately guess The Giving Tree, even with the “carved” heart I created with brown felt on the leg of my cheap brown sweatsuit. Some guessed the apple trees from the Wizard of Oz, some the Tree of Life, and some from random cartoons they watched as children. But, everyone had their own association that made their face light up with wonder. The funniest (and slightly creepiest) part was how many people pretended to pee on me or warned me of nearby dogs. After the thirtieth time, it lost its appeal. But, the best part was trick-or-treating with our kids (yes, my husband dressed as a lumberjack!) and having all the kids come up to me, some scared and some just curious, but all trying to figure out how a tree came to life. At times, I’d just stand still and move as some kid passed me, freaking them out at first. And there were a LOT of pictures taken. There’s probably even a video of me having a dance-off with a Bee Girl at a bar. I don’t know for sure. I’m just saying. I cannot say how important it is to make a good base. I used my very tall, very skinny sister to help with my first base and this simply did not work. You need someone bigger than you to use as your base. The object is the find someone bigger than you, if possible. If not, you have to trust someone else to create your all-important base. I’m too much of a control freak for that. Use cardboard, or thick paper that will hold up, to cut and place between a circle of small wooden dowel rods. Place the cardboard at the top of the dowel rods. This will give the person you use for your base something to hold onto as you build around them. 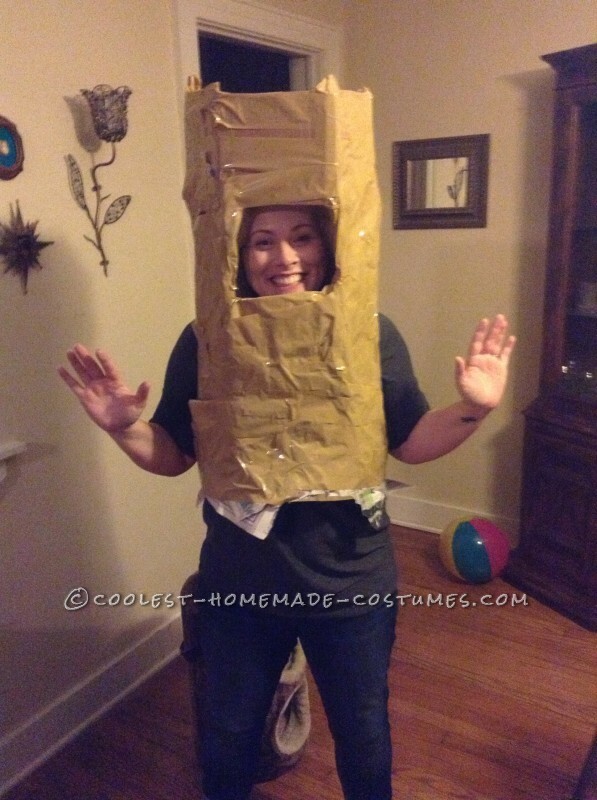 Using packing tape, stick side out, circle around the person, careful to create holes around the person’s arms and face. I only went to my natural waist so I could freely move my legs, but you could go down as far as you think you’re able. Just keep in mind, you’ll have to get this on and off and I didn’t want to just slip it on and off without making a cut in the back. Next, take newspaper and cover all sticky areas. Use more packing tape and cover the newspaper until it’s all covered (sticky side in this time). Your base person has now successfully completed their job. Give them some high-fives, a beer, and a hug for being so nice. Next is the fun part. Well, at least it was for me. Taking newspaper, I twisted, crumpled – pretty much whatever I needed to do to create bark-like texture for my tree. You can make as much or as little as you want. I used a bunch of crumpled newspaper and packing tape on top as well for a base to add my leaves later on. I then spray painted the tree a darker brown, but you can leave the light-brown of the packing tape, if you desire. Lastly, I used a ton of green construction paper from a local teacher supply store (where you can get large quantities of single color paper). Find the easiest way to get the most leaves out of each sheet to save time. Then I used a ton (a large bag) of glue sticks to hot glue the leaves on. This was the time when I was cussing the most and rethinking why I chose to do this. However, this was the part that impressed people the most and gave such realistic yet cartoonish detail to the costume, which was exactly what I wanted. You can go as big or small as you want here. You can even use real braches and leaves. Be creative! 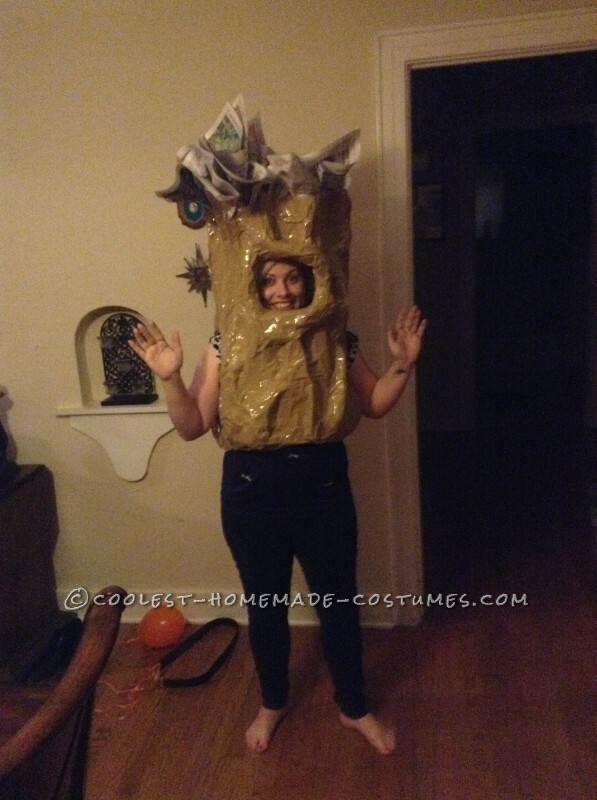 Homemade costume idea posted by Heather L.